We built this game up as one of real significance for our season and our club. After a very disappointing loss a week ago and facing an undefeated side in Collegians, the challenge was as great as it could get. Add to this the loss of our regulars Tutt, Vickers, Bull & Lowe and this game was going to require a tough, resilient performance. 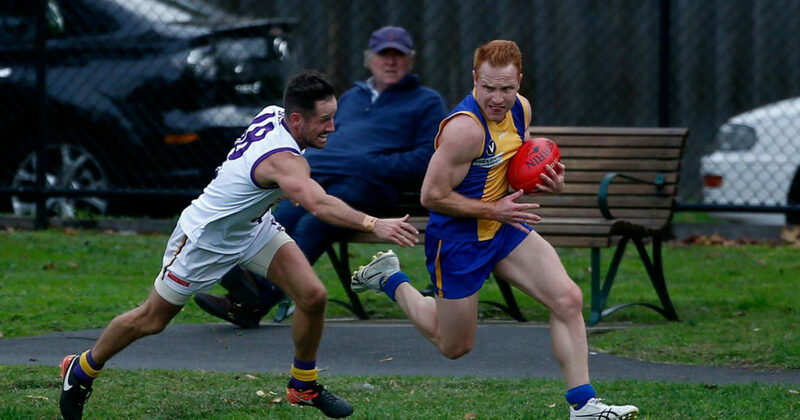 Oakleigh Chargers 2016 B&F winner Lachy Walker (twin of Senior midfielder Andrew) made his debut for the club. These lads were in everything early, working well with Jake Williams, Jake Gotch and our two ruckmen Ant Forato & Matt Cullinan. We kicked with the wind in the first quarter and took a 17 point early lead after we had nine scoring shots to two. In the second term our pressure went up another level as we held Collegians goalless for the term despite their breeze advantage. All players were contributing to our team defence and we also kicked a critical goal, extending our lead to 22pts at the main break. Brendan Close was outstanding in his defensive role on one of the VAFA’s best small forwards, Chris Robinson showcased his foot skills from down back whilst our forwards (led by Pickett, Indovino, Clinch & Fisher) worked harder than ever to lock the ball in the forward line. In the third quarter we had some poor moments with our execution and subsequently paid for our mistakes. Collegians kicked 3.4 to 2.2 and reduced our lead to just 14 points going into the last. Despite this hiccup, we still had belief that we could win the game. Collegians closed the gap quickly to eight points and missed a shot on goal that could have given them further momentum, instead we rallied to kick five last quarter goals to their three to win by 25 points. We have now won four of our past five and head to Trinity next week. We have given ourselves a terrific chance to build on this win and improve every week. It was perfect football weather and as always, the wind was blowing to the scoreboard end as we faced up to a Collegians side with a three win/three loss record to our one and five. We won the toss and kicked with the wind but our ball use in the first quarter was disappointing as we kicked 2.4. Even more disappointing, we allowed Collegians to kick 4.1 against it. Knowing the second quarter was going to be tough, we played an extra player behind the ball but Collegians went into halftime with a handy lead of 35 points. To make matters worse, we had two players injured who took no further part in the game. Believe it or not we lost another two players half way through the third quarter. Things were tough, Collegians kept us scoreless and go onto kick 3.4. And take a big lead into the last change. Mason Martinez was working really hard down back. He was getting great support from Paddy Burnell. The Marchese boys were throwing themselves into everything and our two ruckmen Steve Hogan and Ryan McDonough gave us first use all day. With no rotations possible, the last quarter was going to be a hard slog for our boys. But instead of getting blown out in the last quarter, our boys to our boys credit kept them to three goals – a fantastic effort against all odds. We will continue to work hard and improve our game . We rolled out to Camberwell to take on Old Scotch on what was a very tricky day for football. We welcomed Pat Bohen in for his first game for the Blues after the Oakleigh Chargers allowed him to play on their weekend off. We kicked with a strong breeze in the first quarter and were looking to make the most of that advantage. It was a congested game early and Scotch were defensive from the outset, throwing numbers behind the ball. We were able to generate nine scoring chances but our inaccuracy hurt us. Scotch were able to kick two against the wind and to their credit probably won the quarter. As has been the case in previous weeks, we played our best footy against the wind. In the second quarter our ball movement was better and our use inside 50 sharpened up which allowed us to halve the quarter at three goals each. We took a 15 point lead into the main break. At half time the boys were challenged to be better defensively. We wanted to step up our physicality and get the game on our terms. To our credit, that’s exactly what we did. Keeping Scotch to one behind for the second half was extremely pleasing and set us up for a comfortable win. We still need to be better at our ball use inside 50, playing on instincts, being predictable to our teammates and putting together a consistent four quarters. We are looking forward to another serious challenge next weekend, as we take on reigning premiers St Kevin’s. Best players were Ahearn, M. Lvosky, Deftereos, Pennell and Hawker. After an indifferent first half the Golds took their individual and collective efforts to a higher level to embrace the contest and run out comfortable winners over an enthusiastic Old Scotch. The game, like all, was affected by a very strong breeze favouring the bowling club end of the Camberwell sports ground and the coach did state the outcome would ultimately be decided by which team could score goals into the breeze. After a goalless opening quarter the Golds kicked three goals into the breeze in the third quarter, which proved decisive in the end result. Credit must go the players who were able to restrict their opponents to a meagre five points in the second half. Combined with some very good run and better decision making with the ball in hand, they were able to demonstrate that when they combine well and play to their abilities they are a match for most teams in this division. The last quarter saw the Golds pepper away and be a little wasteful, but in reality the game had already been decided and we were able to enjoy a return to the winners circle. The Golds were well served all day by Matt Simons off half back and James Bailey on a wing who repeatedly gave us impetus and were always on hand to provide an option as we looked to transition from defence to attack. Better players were Bailey, Simons, Melissinos, Canny, Riley, Rando and Brasher. Yes… we had a draw. Playing the top team, we would learn a little bit more about where we are at as a playing group and just ten minutes into the first quarter we knew we could match it with South Melbourne. Again our pressure around the ball was fantastic. Both sides were getting plenty of inside 50s with little reward on the scoreboard. Our game style and structure were the best it’s been all season. With a new mix in the midfield and number of changes from last week the girls adapted well and played team first footy. At halftime the score was 1.3.9 apiece, with our captain Carle playing deep forward all game registering our only major. There was no score for either side in the third quarter. We were rock solid in defence as SMD had plenty of chances to score. It was an amazing game – the girls showed plenty of skill and our link up footy has improved to a new level. The last 5 mins of the game had the footy in the SMD forward line and any score would win. What a great test for the girls as they held their nerve and played close checking footy – time after time we cleared the ball. When the siren sounded you would have thought we had won. We can only measure our success as a group by how we feel after each game. The team bond and enthusiasm in the rooms is infectious. Best were Abbey Snell, Sally Fyfield, Tina Chokbengboun, Steph McMurray, Claire Clarke, Jess Weltner. The colts headed to Brindisi St to take on St Bedes-Mentone, where we’ve had some close tussles over the last two seasons. We welcomed Liam Farrell to the club and Big Jon was back. We kicked with a strong breeze in the first and gave up the first two goals before getting our game together and taking a 14 point lead into quarter time. In the second quarter we played really well into the wind and broke even on the scoreboard, but we didn’t take advantage of the opportunities we created. The third began with the wind increasing and again we started slowly, not taking our chances before kicking four goals but we gave up a goal into the wind just before three quarter time. We had a sizeable 30 point lead, but St Bedes had last use of the strong breeze. We began well before a couple of mistakes gave St Bedes a couple of soft goals and they began to build momentum that we didn’t handle. We lacked composure and panicked with our ball use and turned it over time and time again. This was all the opposition needed and they kicked seven final quarter goals to win by 10 points. We played well in parts, but didn’t handle the pressure in the last. We must learn to continue to take game on and really want the ball when things get tough, as shown by Ky Morgenthaler and Billy Cooke in the last quarter. A lesson to be learnt.